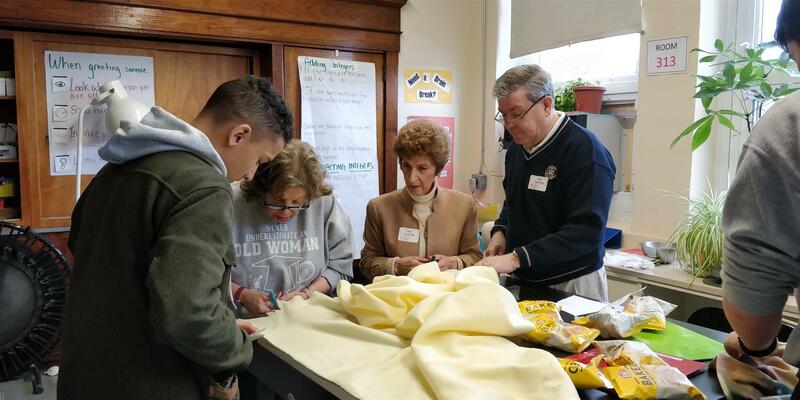 On Thursday, January 10, members of Nutley Rotary joined with Interact Club members at Nutley High School to collaborate with Project Linus, a non-profit organization, whose mission is to provide homemade blankets to children in need. Interact has partnered with Project Linus for the month of January to help make these much needed blankets. There was excitement and energy in the air as we measured and cut and knotted the fringe of a blanket to bring back to our Rotary meeting and show to members. We also brought back fleece for our members to take home to create blankets and bring back to Interact by the end of the month. Many thanks to Interact advisors Megan Dellafave and Jessica Coppola for taking the reins of advising Interact, which is the Rotary companion club for high school.